As a church leader, doing the right thing always comes first. But it will go nowhere if you’re not doing it in the right way. Have you been struggling in your church, but can’t understand why? Maybe you’re doing what you believe God is calling you to do and you’re taking wise counsel from others, but there doesn’t seem to be any progress made? This post might be for you. Help them find a ministry that matches their current level of commitment and stretches them just a little bit beyond. No one is as committed to our local church as we are, pastor. Well, almost no one. There’s Jesus, of course. And we might have some hard-core members who live, breathe and die by their congregational involvement. The Christmas story is so simple. And so weird. Everyday simple – literally. As in, millions of times every day simple. Other-worldly weird. Not-even-in-a-comic-book weird. It-can-only-be-a-miracle weird. The life of a disciple is supposed to look more like sacrifice than success. If your ministry is about helping people reach their full potential, I have a favor to ask. For almost 2,000 years, Christians haven’t just been the church, we’ve gathered for the event of church. Because the event matters. Church is not a place we go, it's who we are. The New Testament is really clear about that. But because church is who we are, it also matters a great deal that we go to church, too. We seldom celebrate consistency, integrity and humility as much as we should. But those are the character traits that make for real ministry success. There are three lists of pastors that I’ve been keeping track of in my head. Maybe you’ve been keeping some similar lists yourself. Bivocational ministry is more than a pit-stop along the way to "real" pastoral ministry. It's as real as pastoring gets. And it's becoming very common, very fast. If I could only teach one vocational principle to young pastors-to-be, it would probably be this. Learn how to pay the bills outside of your pastoral salary. You’ll probably need it. Urgency doesn’t pull new people in, it reminds them why they’re staying away. When I was in training to be a pastor, I was taught to create a sense of urgency to reach people for Jesus. The so-called Christian culture is going... going... gone. We need to get ready for what’s next. We can get excellent customer service from strangers. A great church experience should be about relationships. When I’m a consumer, I want great customer service. Whether online or in real life, I want products and services that meet my needs in the best, quickest, friendliest manner possible. But I don’t want that from church. 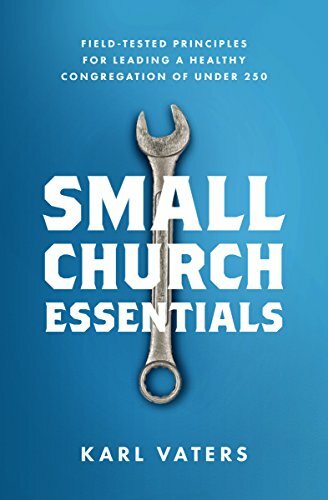 What if every pastor saw their church, not as a stepping-stone to something bigger, but as an investment to make with all their heart and soul? Have you ever had a chat with someone who was constantly looking over your shoulder to see if there’s someone better to talk to? A lot of us may be doing that to the church we’re pastoring. If you don't decide whose opinions carry the greatest weight, the loudest voices will win and your ministry will be reactive, not proactive. Effective leaders always seek wise advice and counsel. If you, like me, are a small church pastor, you know there’s a huge expectation for us to treat everyone’s advice as though they all have equal value. The disadvantages of a small church are regularly outweighed by the privilege we have of discipling people on a more personal level. I had another one of those “only in a small church” moments last Sunday.